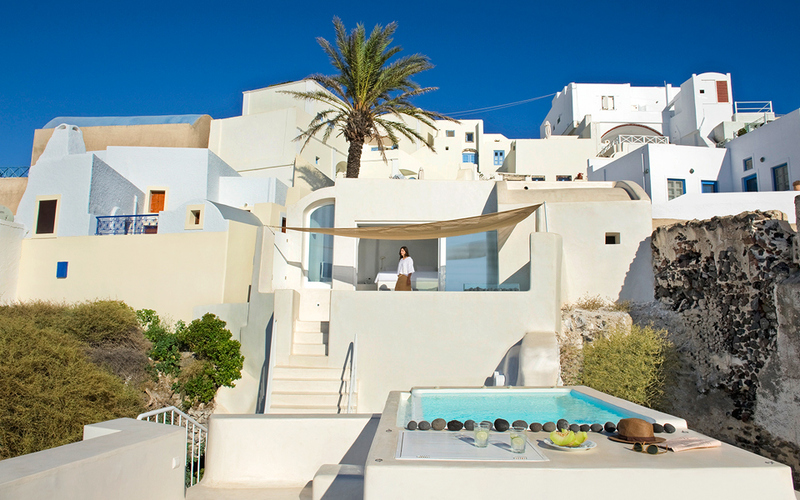 The spectacular of Santorini's caldera unfolds for guests of Villa Aesthesis to savor. When the architect Alexandros Kapsimalis designed Villa Aesthesis his intention was to awaken the senses, as the name of the establishment suggests. He brought his vision to fruition by harnessing the sun rays that bathe the building and the sea that sides it, and by using more implicit means, such as light, or lack of, sound and texture. “Besides the sun and sea, the senses are also awakened by light. 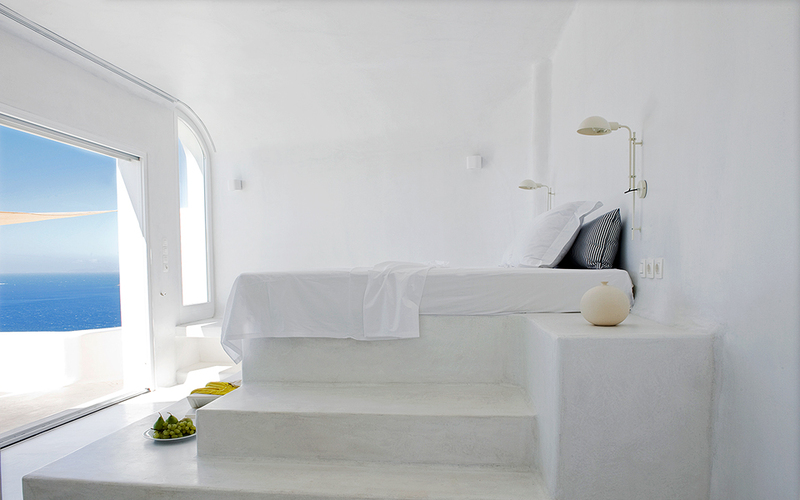 A transition plays out from the subdued light conditions prevailing in the below-surface lower level to the fuller light of the first floor,”Kapsimalis says, who is also the owner of the traditional style building in Santorini in the heart of the Kato (Lower) Fira area. The rooms have been designed to give guests the best possible view as if set in a picture frame. 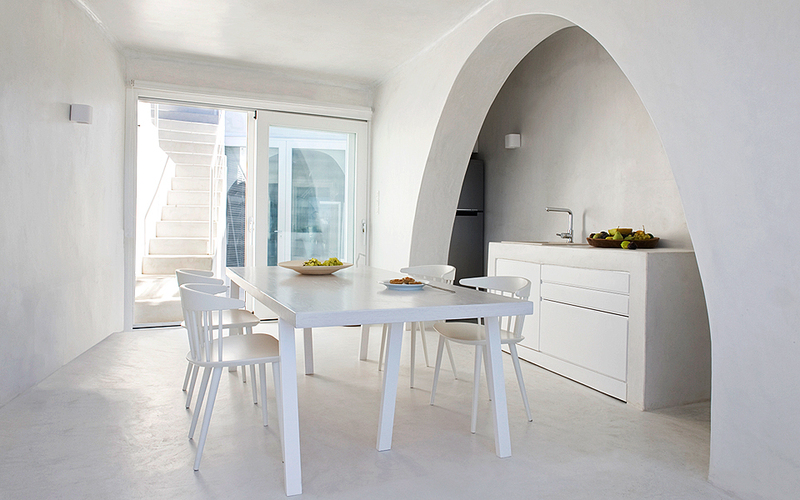 The villa employs tones of white with natural blue reflections to create a sense of harmony. Guests can fall asleep to the tranquil sounds of the private pool's water. 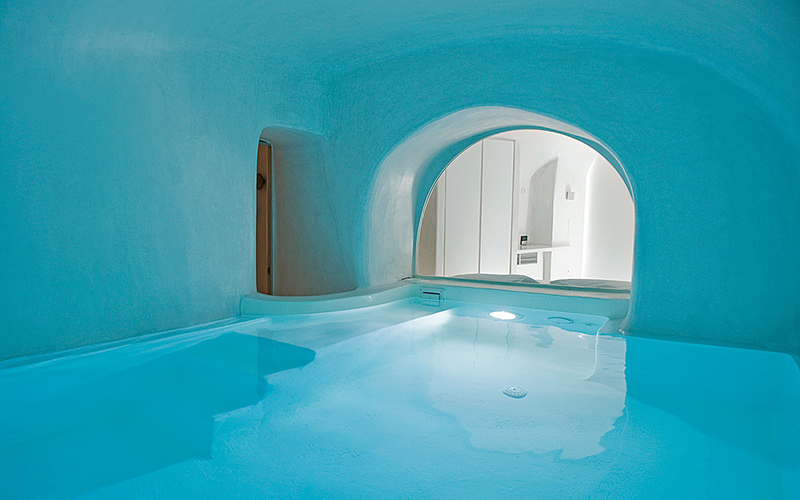 The gentle sounds produced by the blue pool amid a cave-like setting, which are not released to the exterior, but, instead, contained indoors, combined with the smooth texture of the entire place – a result of the trowelled screed surfaces applied throughout the interior – function in a complementary fashion, offering guests a unique accommodation experience. “This villa is cubist in form, colored white, and extends over two levels. We utilized the below-surface-level aspect characterizing the caldera settlements,” notes Kapsimalis. It offers double access, reminiscent of the old houses in the area, and may be accessed from separate cobbled paths (kalderimia). As the name suggests, the architect's intention was to awaken the senses of the guests. This centrally located white building, situated close to shops, cafes, restaurants, and nightlife spots, is designed to accommodate five persons. It features a terrace with a jacuzzi, an indoor pool, vaulted ceilings, smooth curves as well as distinct, yet discreet, corners, without excess, or too much sharpness. The tug-of-war between sustainability and tourism development on Santorini.